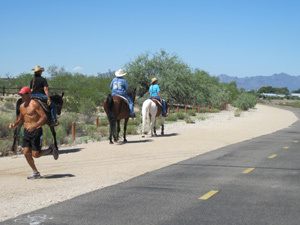 Within Pima County, the City of Tucson and the Towns of Marana and Oro Valley are over 100 miles of river parks and greenways, many of which presently connect, providing a car-free environment for commuters and recreational users. River Parks include the Rillito River Park, Santa Cruz River Park, Pantano River Park, the CDO River Park, and eventually the Tanque Verde River Park. Greenways include the Julian Wash Greenway and Harrison Greenway. What is the difference between a river park and a greenway? A river park is intended to be developed on both sides, and measures up to 100’ wide or more. A greenway is usually built along one side of a smaller wash or in some cases, along a roadway, and can go up to 50’ or so in corridor width.